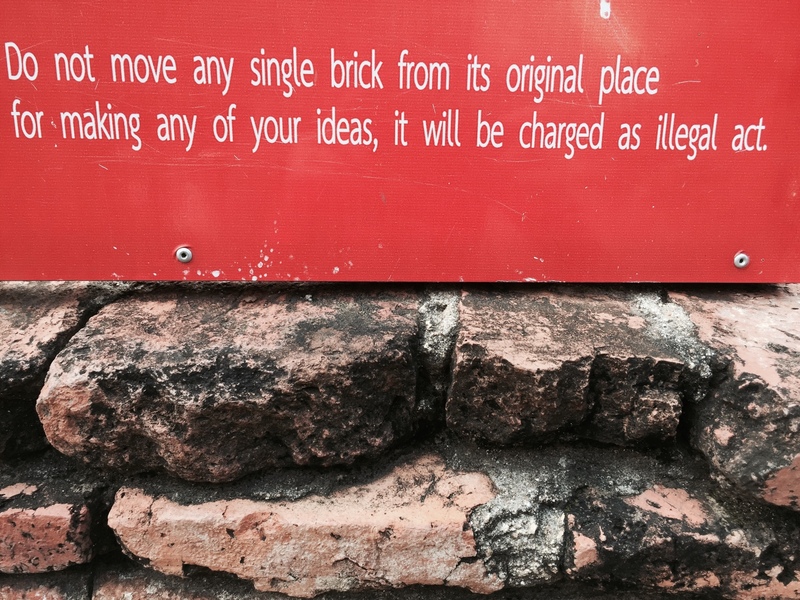 We arrived in Ayutthaya ready to explore and walk off our sea-legs from the gas-pumping van trip from Bangkok. 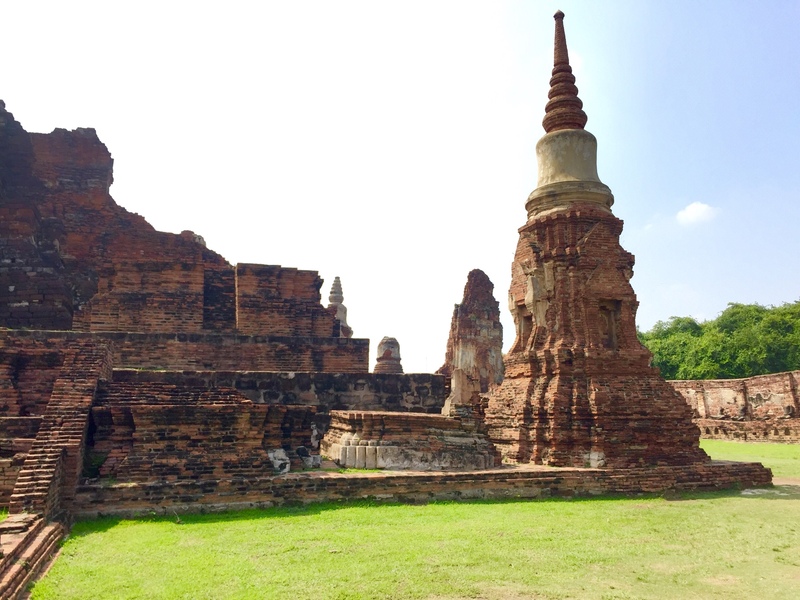 Ayutthaya was the first stop on our trip to really begin exploring temple ruins and see rural (ish) Thailand. We found a shaded area to recover from motion sickness and began looking online for the right place to stay. A well-priced guesthouse nearby sparked our interest so we bartered for a tuktuk and made our way. We were dropped off on a street that T-intersects with the train station and is lined with food stalls and shops on either side. At this point, we weren’t sure where our guesthouse was but that it should be near. We wandered past some roosters and into Baan Are Gong, immediately we were both enamored with the detailed woodwork from the floor to the ceiling. The cozy guesthouse borders the river, a quiet dirt road, and a nearby street market. The river flows quickly and is rumored to have garbage dodging snakes swimming within. 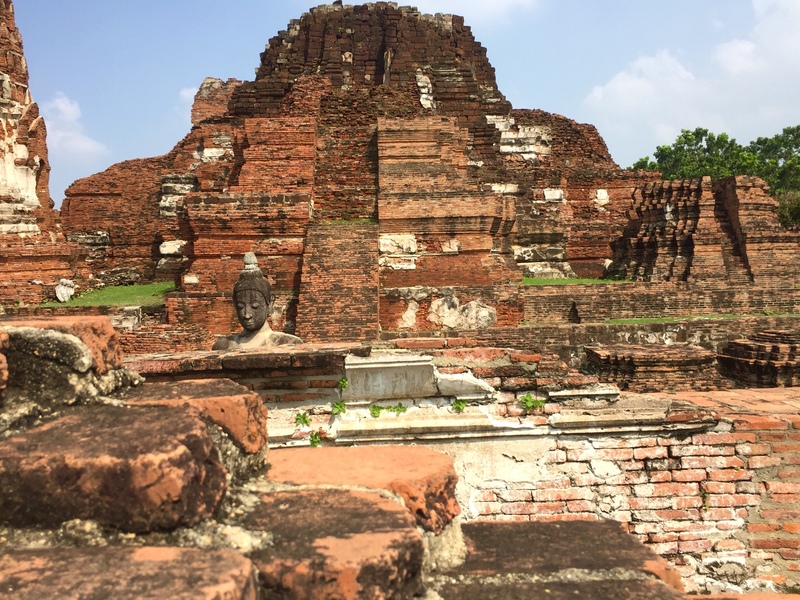 Ayutthaya was our first Northern stop outside of Bangkok, it is peppered with temples, markets, and humans driving elephants on the streets. 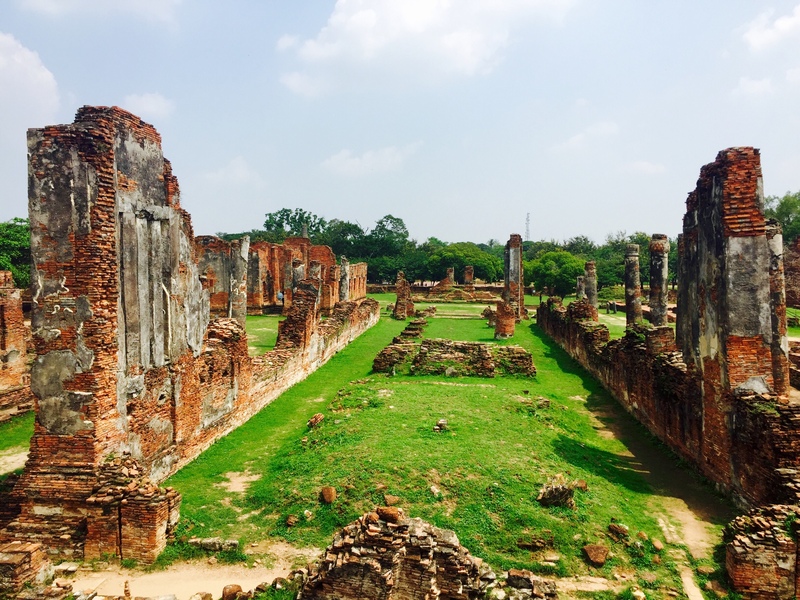 This quaint town is a small bustling mini-city full of friendly locals, natural beauty, and historically rich temple ruins. If you visit this area it’s worthwhile to read about what had happened to these temples prior to visiting. We rented bikes from December House for 100 Baht/day (I got them to throw in a helmet for free. It was probably free because they were laughing at me) We used the bikes to explore markets in search of new fruits to try and temples ruins. Staying hydrated in the heat was difficult, crossing the street was more difficult. Four to five liters of water per day and cross with the elephants, the cars stop for them. We were repeatedly chased by ferocious ‘low season’ dogs, a rare breed of dog that hunts in packs and lies dormant most of the year except when there are few tourists in town. They are known to hunt small groups of tourists at all hours of the day and night in large packs yearning for scraps of food to eat. Staying hydrated in temperatures above 35 is like trying to visit every temple in this lively town during one day. Near impossible, so plan well and leave your guesthouse prepared. 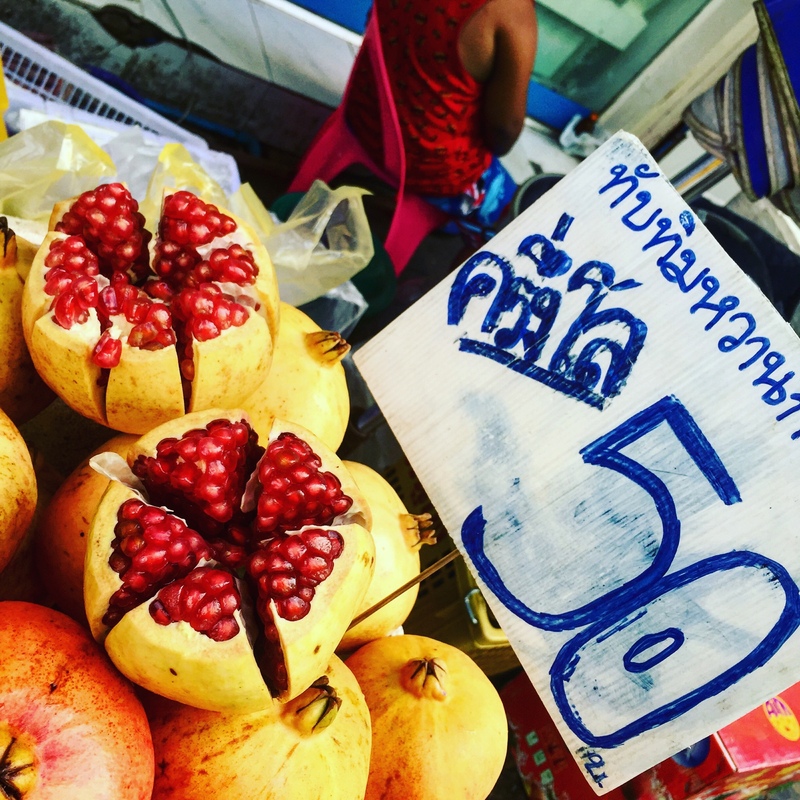 Not renting a place with air conditioning or a pool and not getting to the floating market. Renting bikes to ride to the temples and explore on, meeting American friends that let us swim in their guesthouse pool, night market food, the friendly staff at December House and the scenic ruins. Being chased by wild dogs and seeing so many tourists participating in the exploitation of elephants in captivity. We took the first class night bus to Chiang Mai and we were happy with the service (bring warm clothes and your travel sleeping bag, the air conditioning is very cool). If you want to book this try the website or go to December House and have their staff book it and select your seats for you for a 50 Baht surcharge on top of the ticket price. Book this at least two days in advance or you risk staying an extra day. Same goes for the night train. Book a place that has air conditioning and a pool if the weather is forecasted to be over 30, we didn’t do this during the ‘cool’ off-season and we regretted it. 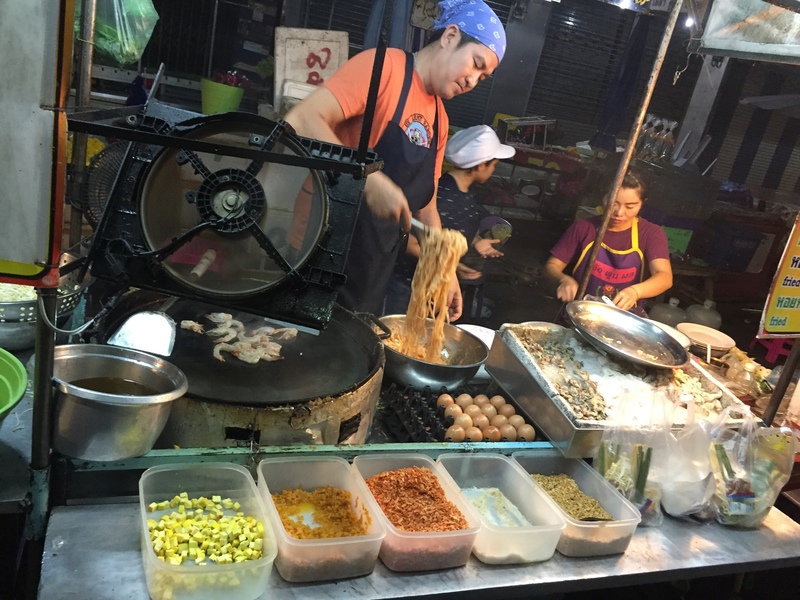 Find the KFC in town and head to the market across the stree for Pad Thai.